Confessions of a Reviewer!! : REVIEW: Kit Power - GodBomb! REVIEW: Kit Power - GodBomb! 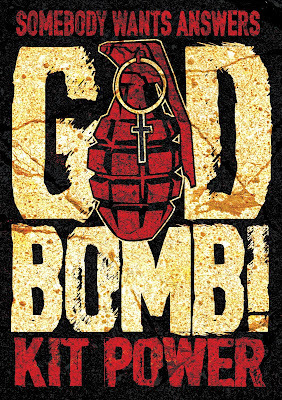 A copy of GodBomb! was sent to Confessions of a Reviewer by the author Kit Power in exchange for an honest review. This is said review. This book is published by Sinister Horror Company. OK so I know Kit Power. I worked with him for a while on another website, I have read two of his previous stories Lifeline and The Loving Husband and The Faithful Wife. He has also provided a guest review of a book on this very blog. I am admitting this because there may be some people who would say I am only doing this review because I know him and think he is a top bloke. Totally untrue. He is a top bloke though! I am a reviewer first and foremost and I think most people who would follow my reviews know that the biggest thing for me when giving my thoughts on a book is honesty. Kit knows this more than most. He knows how I operate and knows that if I thought this book was pure crap, I would say so. By the way he has no idea what is in this review either so at this point in time he is as blind as you are reading it. A preacher is conducting a Sunday morning service when a young man in the congregation stands and asks him simply, “Do you believe God is really real”. The preacher sees an opportunity to convert someone and bring him into the flock and asks the young man to come to the front. When the young man approaches, something about his demeanour doesn’t seem right. What transpires from this point is a day spent locked inside a small community centre filled with shear, unadulterated horror and terror for all involved. It is a simple question. A simple answer should suffice. And that, my friends, is all I am prepared to divulge from this story. It’s been a while but it’s two for one review day. Review One: Un-put-down-able! Even if it’s £40 (or your currency equivalent), you must buy this book! Review Two: I have been waiting on this coming out for a long, long time. After reading Mr Power’s previous stuff, I was anxious to see if he could pull off the big one, his first full novel. By the gods, has he ever! On reflection, I am struggling to put this book into an actual specific genre. I would call it horror, a thriller, a psychological horror, a psychological thriller or even an examination of the world’s impressions of religion and the big question – does God actually exist. For myself it’s an interesting question. Many close to me would know my own beliefs. I would say they aren’t that far removed from the young man in this story. He is looking for undeniable proof of existence. A sign. Anything. This book, unfortunately giving today’s society, is an example of what could possibly happen when someone, who is clearly deranged, asks the same question. That is what makes it so terrifying. Although there are about eighty people in the congregation in this story, we only have about ten main characters who you get to meet and live the horror with, through their eyes. There is of course the young man himself. You never learn his name. This adds a certain mystery to him. You also know nothing about his past. He flips between tears of sadness to moments of madness and sometimes you cannot quite follow whether he has the Cajones to follow through with his threats. He has moments of sweetness and moments of utter nastiness. You need to make your own mind up on him. The other main people in this (named in a sort of cast list at the beginning of the book) are a mismatch of people from all walks of life. Deborah, a young woman in a wheelchair who, to me, doesn’t really know her path in life. Chris, a nervous and slightly deranged young man who can never make his mind up whether to go it alone or be a sheep. Twitch, an alcoholic who really just needs his next fix. Katie, a sweet, young, innocent girl who grows up very quickly when she is thrown into situations that she never dreamed she would be part of. Alex, another young girl who seems to have the opinion that if anyone is going to put a stop to the madness, it will be her. Mike, a member of the church band who has more life experiences than probably anyone else in the congregation and seems prepared to team up with Alex to try and save the day. Finally we have Emma and Peter. Husband and wife, patiently waiting on the imminent birth of their first child. The one thing that every one of these characters have in common? The way they are absolutely, beautifully written. They are all so different and yet all the same. You feel like you know them all as soon as you read their names. You can empathise with them. You can sympathise with them. You can love them. You can hate them. One minute you are on their side, the next, totally against them. They ebb and flow across the pages and you see so many different aspects of the story from so many different angles. This is essentially a story of someone trying to prove a point. A point that there is ultimately no proof for. Or is there? Seeing the story through the eyes, and more importantly the minds of the people involved, you start to doubt whether it is just a ridiculous quest for answers or whether the proof may be forthcoming. Some things happen that are just inexplicable and make you question your own beliefs and what you have as your mind-set. Now for someone like me that is a huge thing to be able to do in a story. Let’s face it, it’s make believe so for a writer to be able to convince you that you are actually living in the moment, in the story, and to question yourself, that takes talent that not a lot of writers possess. To be able to trick the reader in this way is an extraordinary feat that has to be applauded in the biggest possible way. There is one scene in this book where someone is dying. There is a bit of weirdness going on at the same time but the writing in this scene is sublime. You read it from the mind of the person who is dying. It is written in such a way that you share every single experience they are going through from their mixed up thoughts to the realisation that their body is shutting down and they are losing the fight. I quite honestly don’t think I have ever read a death scene from the perspective of the dying person that has touched me so much, nearly to the point of tears, at what they were going through. It is both horrendous but beautifully serene. There is a lot of horror in this. Horror of the mind. I’m slowly learning that this can be the worst kind. There is blood. There is death. You share in one of the most beautiful things that could ever happen to a human being. There are a lot of questions. Some you get the answers to and some that will remain unanswered for centuries. There is total devastation. I could go on and on about this book for hours and hours but alas I want to keep you interested, not bore you to tears. To summarise: Honestly? Just buy it. This is one you absolutely need to have on your shelf. ★★★★★ A perfect debut novel. 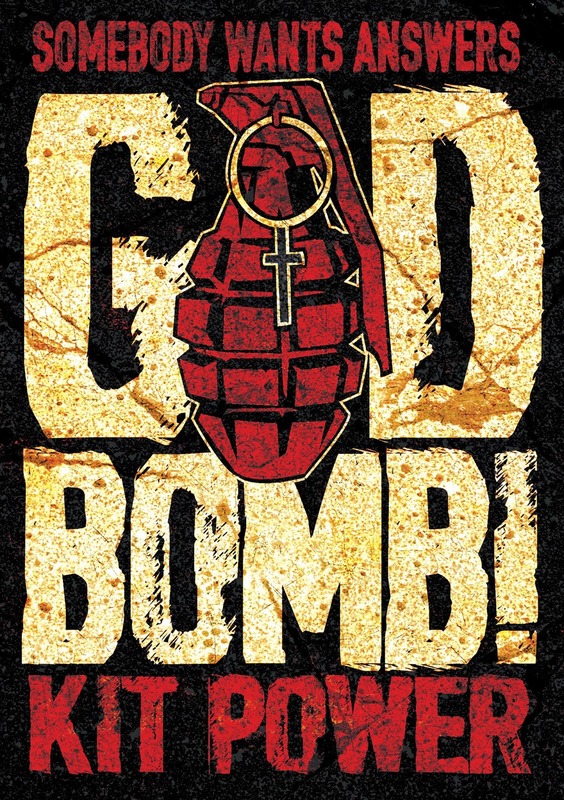 If you would like to help support Confessions of a Reviewer then please consider using the links below to pre-order GodBomb! or any other books from Kit or indeed anything at all from Amazon. This not only supports me but also lets me know how many people actually like to buy books after reading my reviews. North Devon, England. 1995. A born-again revival meeting in a public building. The usual mix of the faithful, the curious, and the desperate. And one other – an atheist suicide bomber. He's angry. He wants answers. And if God doesn't come and talk to him personally, he's going to kill everyone in the building.. 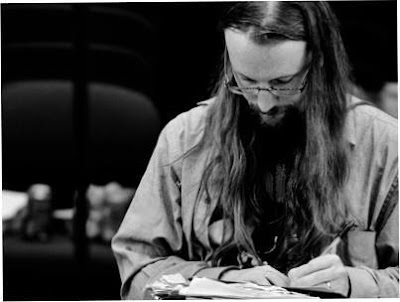 Kit Power lives in the UK and writes fiction that lurks at the boundaries of the horror, fantasy, and thriller genres, trying to bum a smoke or hitch a ride from the unwary.